The author’s website has a great map of Liberty’s adventures through Germany and links to websites where you can read the Grimm fairy tales for free. I did not find any book trailers online. **Full disclosure – I received a print copy of this book for free from the author. The average ten-year-old girl seldom travels far from home. She doesn’t worry about being kidnapped by witches or imprisoned in medieval castles where children are ensnared to meet their unspeakable demise. She rarely gives thought to curses, potions and magic. She certainly isn’t risking life and limb to decipher ancient rites and lost treasures…. But Liberty Frye is about to discover she is not just an average girl. Personal Reaction: I liked it! author’s website No video book trailer found. Summary: 7th grader Georges (silent S, named after artist Georges Seurat) is getting picked on at school, dad has recently lost his job, mom’s an absentee doing double shifts at the hospital. They have to sell their house and move into an apartment only a few blocks away in Brooklyn where Georges gets sucked into his new friend Safer’s Spy Club to determine whether another neighbor is evil. Friendship & family come together in this story so well. Personal Reaction: Now this is getting tough – another one to nominate for SSYRA! This book was expertly crafted as opposed to just being written. I love it when the climax pulls so many pieces of the story line together that it makes you dizzy. The LIE, the revelation to dad, the mom, the blue team… it was awesome. My favorite funny is p.74 stomping in slippers. Curriculum or discussion topics: bullying, Science (sense of taste unit, bird watching), Home Ec (so many foods to make and describe! ), PE (volleyball, Capture the Flag), Art (color theory, Seurat, architecture, shabby chic, repurposing items) and Language Arts (the Science teacher has them write using taste sensory words, Scrabble tile messages, practical fortune cookie messages). Do I love this or what??? full disclosure: I received an ARC of this title as a Twitter prize, but was not compensated or asked to write a review for this book at all! This is my first ever edition of “In My Mailbox,” in honor of my friend Christina at BookTasty who in turn credits The Story Siren. Since I’m very much a newbie at blogging and Twittering, I have been amazed at the generous opportunities that are to be found by participating in conversations about reading. The next win was for Liar & Spy by Rebecca Stead from Random Buzzers. 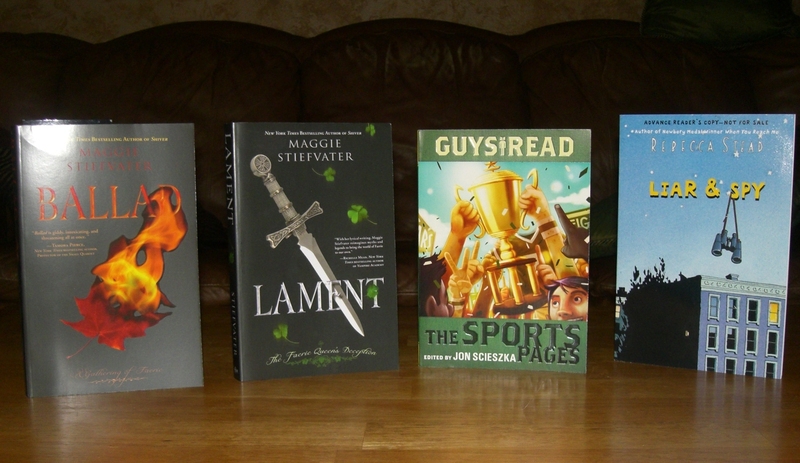 And the latest gift is a pair of The Books of Faerie by Maggie Stiefvater, Lament #1 and Ballad #2, from Flux Books. Beyond the actual physical print books that have arrived by post, I have been also been fortunate that some people have found me and asked for my book review opinion though now I realize I’m going to have to be super picky and stick to my AA scifi/fantasy genre in my acceptances. I have received the following via e-mail and will also chat each of these up as soon as I finish. Possible post dates are in parentheses… I’ve got so many good books on my to-read list on Goodreads, I don’t know how I’ll ever keep up with reading, posting, and (oh, yeah) working! Thank you to everyone who shares the love of reading with others!